I tried to learn a few of the old techniques and want to show you the very fist one today. This is a straw weaving craft in the shape of a heart. It’s quite easy to do, so try it out and tell me how you like it. For this straw weaving craft you need a technique that’s called “Arrow Plait“. You can buy dried straw in craft supply stores, but for the traditional weaving you’ll need long straw with the grain still attached to it. For the straw weaving craft of the heart, I used wheat. But you can also use rye or barley. Cut the straw right before it’s ripe. Of course you’ll need to ask the permission of the field owner beforehand. 1. 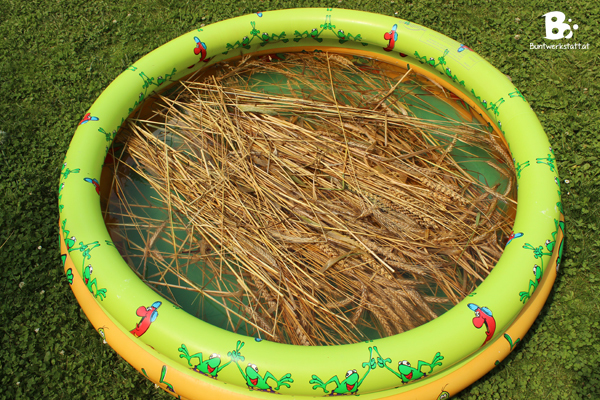 Let the straw soak in warm water for a few hours. If you skip that step, the straw will break when you try to bend it. 2. Tie 7 straws together just below the head. Use strong twine or thin floral wire. 3. Arrange the straws with the heads to the bottom. One straw should be in the middle (it will stay there for the whole pattern. ), 3 straws on the right and 3 straws on the left side. 4. Take straw number 1 (the straw on the bottom right side) and bring it across the FRONT of the middle straw. Bend the straw back around the middle straw. The straw should now be on the top of the right stack. 5. Now take straw number 2 (the straw on the bottom left side) and bring it across the BACK of the middle straw. Bend the straw back around the middle straw. It should now be on the top of the left stack. 6. Repeat those two steps again and again. Always bend one straw from the bottom right side OVER the middle straw and back again, and then bend one straw from the bottom left side UNDER the middle straw and back again. This technique is called “Arrow Plait”. 7. Weave the arrow plait for about 4 inches and secure the ends. For the straw heart you need 2 arrow plaits. 8. Make sure the lenghts of both plaits are equal. Cross the heads of the plaits and tie them together. Then tie the other ends of the plaits together in a parallel fashion. 9. Bend the straight ends down to form a heart shape. Tie the straw together and trim the ends. Use your hands to bend the heat in shape. 10. Tie the straight ends to the back of the heart and finish it off with a nice ribbon. You can use whatever color you like, but favored colors are blue, white, yellow, orange and gold.